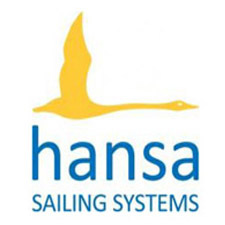 This year numbers were down for the Hansa Travellers’ annual visit to Nott’s County Sailing Club. Whether the new split into a Southern, Western and Northern circuit or the rather intimidating weather forecast was the cause is uncertain. 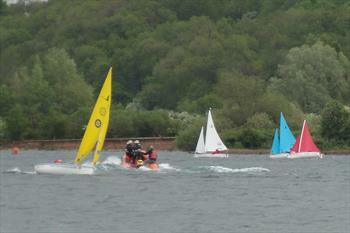 In any event the racing was close, the wind consistent, and the sun shone. A dozen boats assembled to race in the morning when the wind varied between 13mph and an occasional gust going up to 17 mph. Five Liberty boats were first away and Melvin Kinnear established a lead which he held for the whole race. 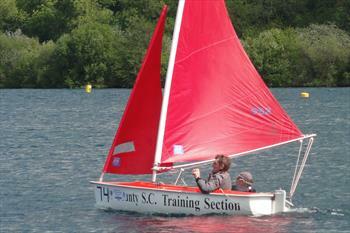 Second place went to local sailor Joe Taylor. Unfortunately equipment failure forced Melvin to retire in the second race which was won by Joe after a heavily contested race between all competitors. The double and single handed 303s shared their start together with the only 2.3 entry sailed by Lindsay Burns. Both morning races were only resolved after close racing and frequent change in position. Much to their consternation the 303s saw Lindsay’s 2.3, after a superb start, getting to the first buoy in front of the fleet. The morning’s racing finished at 12.30 and both competitors and supporters were able to warm themselves up with Pauline’s array of hot meals. This year the bar wasn’t opened until later in the day, which, if nothing else guaranteed a consistent number of spectators. Initially conditions remained much the same when racing resumed after lunch, although the wind was dropping steadily down to around 7mph during the third race it built up again with very heavy gusts (20mph+) for the fourth and final race. Despite Melvin being effected by more equipment problems and having to drop out of the fourth race. 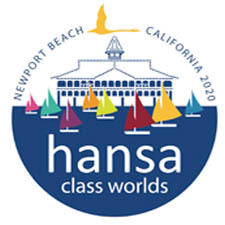 The racing, especially between Kate Hedley and Leslie Philip in the single handed 303 class was close indeed, finishing on equal points. Kate took line honours in the last race and clinched her overall win. The racing was extremely competitive throughout the day with many changes of position in all fleets. Racing finished at 3.30pm leaving time for the boats to be packed up as well as enjoying some lovely afternoon tea and cakes before the prize giving. The glassware was handed out. It was agreed that the weather was spot on; that the sailing was a pleasure to watch and it was good to see many travelling friends again. Thanks were given to all involved. Pauline from the galley got a standing ovation for her contribution to the day.